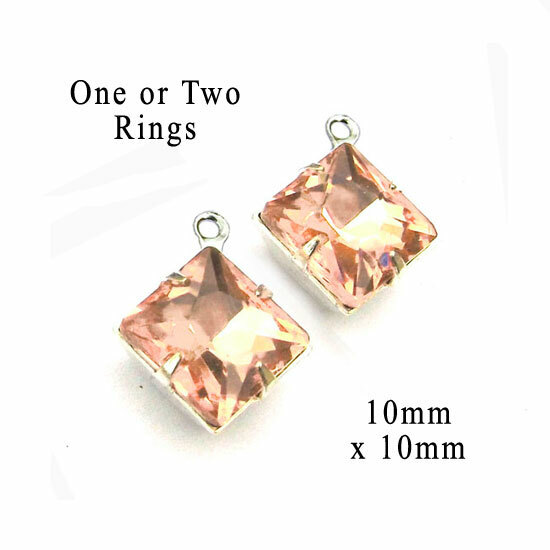 Peach Glass Beads – spring color for DIY jewelry! It’s a gray February day and I’m so looking forward to springtime! 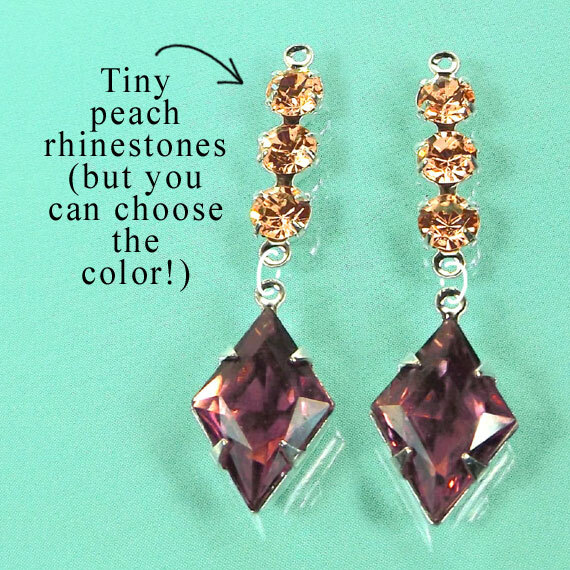 So these pretty peach diamond-shape rhinestones are looking extra special right now. 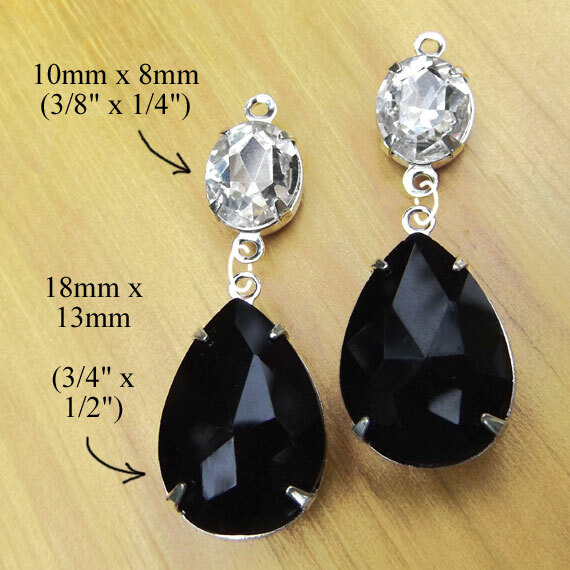 Easy to use and affordable DIY glass jewels. That’s what it’s about right now, yknow? And champagne strikes me as very prom-ish. Just saying! 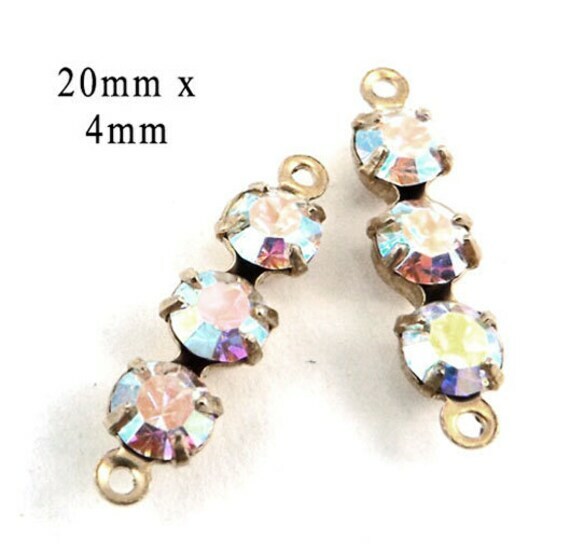 The sparkle and tiny glints of color are so pretty! I’m trying a little experiment over in my Etsy jewelry supplies shop. 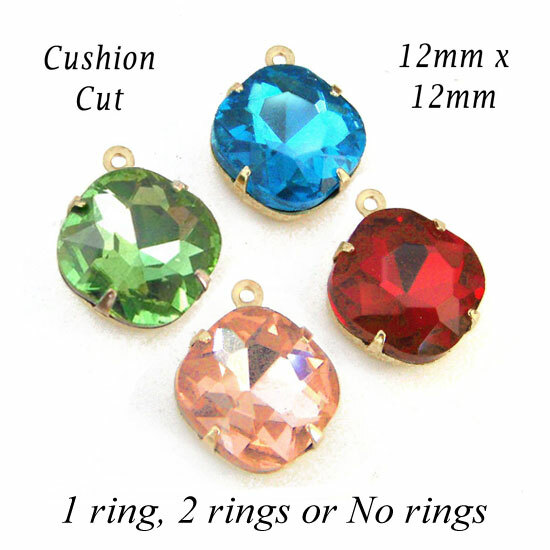 I’ve made a listing where you can pick any three pairs of “cushion cut” glass beads or jewels in one listing – and you get to choose the color(s). I want to see, over say a month’s time, how many times people want three pairs of the same color, or all pastels, or all warm colors, or – well, you get the idea. That’s called a win for me, because I learn stuff (and maybe make a few extra sales), and a win for you the customer, because you get just what you want, and you get a really good deal. See? Win! When you hear someone referring to an “AB” finish on their beads, they’re talking about an “aurora borealis” coating. It’s a treatment that gives glints of many colors over what would otherwise be clear glass. 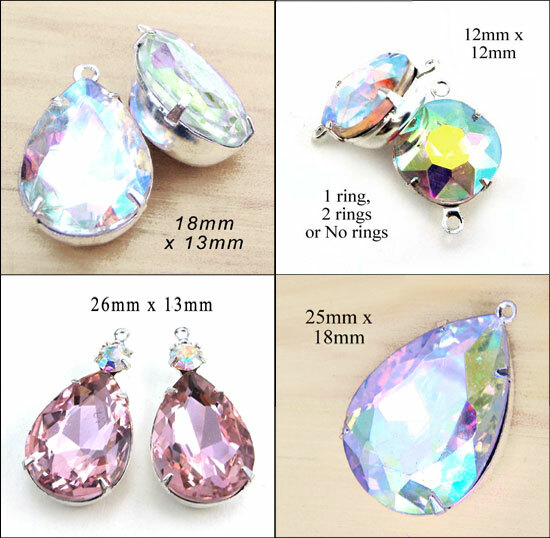 I think it might have originated with Swarovski but by now, most reputable manufacturers have their own version. 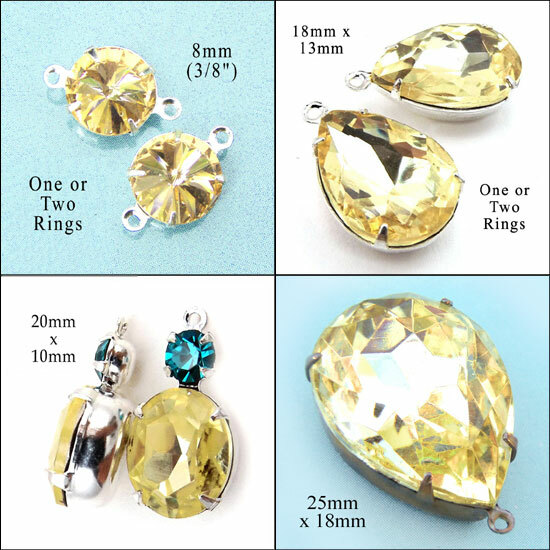 And just a quick peek at some of the jonquil yellow glass cabochon jewels I’ve got in stock right now. Jonquil is such a lovely crystal! There are a few I haven’t got listed yet, too – so if you’re looking for a particular size or shape, and don’t see it? Please do ask! Now don’t get me wrong – I love fine gemstones. 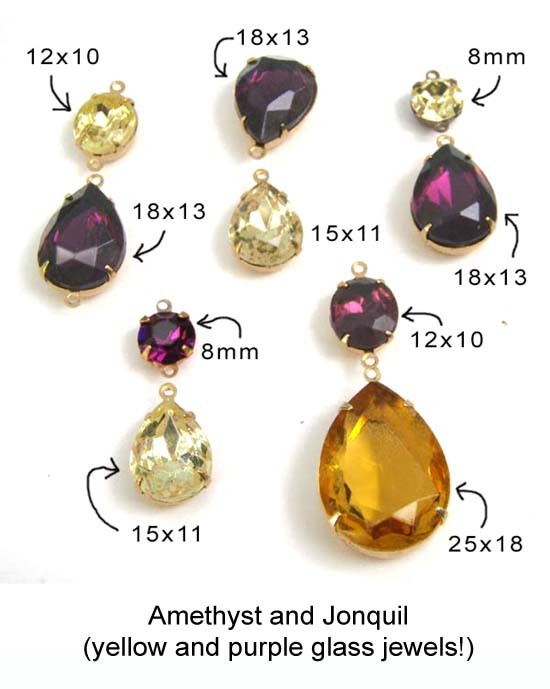 Amethyst and jonquil (or citrine) can be truly beautiful. 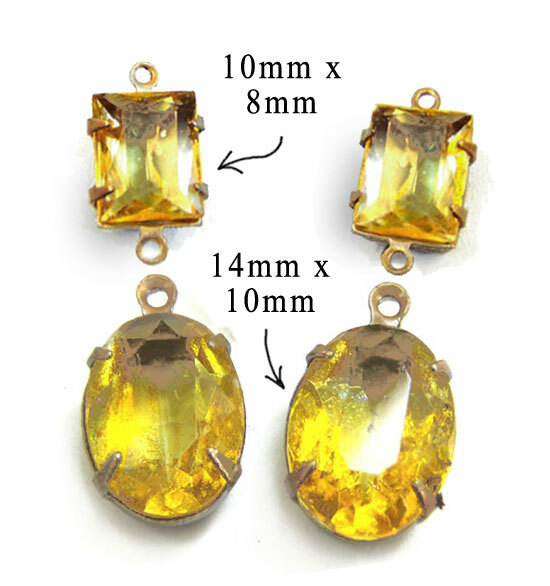 But, you know, if they have good clarity and faceting (the way we love them) they’re also really expensive. Once I got over my snobbishness and realized how beautiful cabochons and glass jewels could be, I never looked back. These are gorgeous. And affordable. That’s a win. 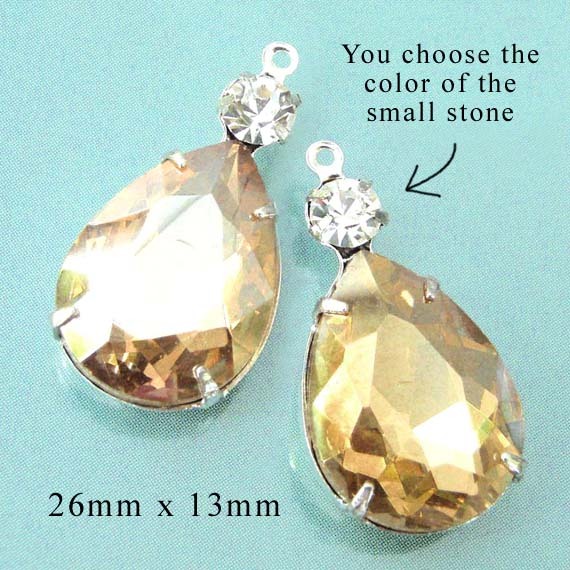 Yes, topaz is sometimes considered a “Fall” color – I guess because it’s the November birthstone. But it’s wonderful for Spring. Sunshine, longer days, golden yellow – these are light-filled summertime images for me. Affordable pretty color – love it!